The long days of summer are here and solar production is at its peak for Cincinnati. We have plenty of sunshine here in the summer, but many people ask us if we get enough sun during the rest of the year to make solar projects feasible? The answer is, absolutely! 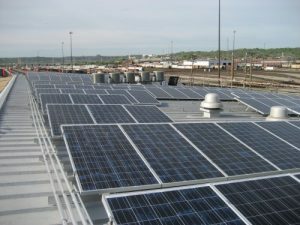 With thousands of solar power systems installed in southwest Ohio, there is no doubt solar works here. The table below shows the percent of our annual sunshine we receive each month of the year. 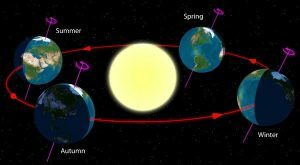 Obviously our best sun conditions occur from March thru October, but even those cloudy months of winter provide some good solar days. The sun’s angle above the horizon peaks on June 20, the summer solstice, and reaches its minimum angle on December 20, the winter solstice. How does this play into the best orientation of solar panels? Ideally when the sun is perpendicular to the surface of solar panels, the panels receive optimum sun and thus produce optimum power. So to maximize production at the summer solstice, we tilt our solar panels at 26 degrees so the panel is at a right angle to the sun (26 + 74 = 90 degrees). This would make production optimum for one day of the year, and suboptimum for the rest of the year. But solar is forgiving and solar power systems which don’t have optimal siting still produce lots of solar power! There is a large “solar sweet spot” such that, even if the tilt and orientation of the panels towards south is not perfect, we take a relatively small performance hit. We mount the solar panels flush with the roof of the home. 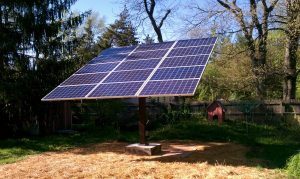 We mount the solar panels on a fixed tilt mounting system on the ground. We mount the solar panels on a variable tilt mounting system. In the end, if the modules do not face true south and are not tilted at just the right angle, solar still works and we still produce power. Let’s discuss the three options above. We mount the solar panels flush with the roof of the home. This configuration provides the best aesthetics and lowest installed cost for most residential systems. Typical roof angles are 18 – 45 degrees in the Cincinnati area, the most common being 18 – 26.6. The systems perform well and the neighbors don’t think a space ship has landed on your roof. We mount the solar panels on a fixed tilt mounting system on the ground. This approach is often taken when there is available ground real estate and building roof structure or orientation is not conducive to a solar installation. Here is a solar carport constructed for a client in Cincinnati. The home has a large south facing roof, but it is encumbered by a large dormer and two large chimneys. The carport array tilts at 15 degrees as a trade off to maximize solar production and minimize wind loading on the structure. The array is producing 100% of the electrical needs of the home. At this local farm we had plenty of real estate and freedom to line up the array to face true south with a tilt of 30 degrees (optimum for Cincinnati). In general, ground mounted structures will be more expensive than roof mounted systems due to the cost of building the mounting system. We mount the solar panels on a variable tilt mounting system. This allows the tilt angle of the modules to be adjusted (typically monthly) to follow the sun’s seasonal elevation changes. This approach adds some cost due to the increased complexity of the structure, but the benefits are many. It is easy to mow and trim around the structure, solar production is maximized, and less real estate is needed for the array. 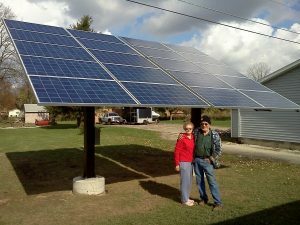 SunRock Solar installed a seasonally adjustable pole mounted array in Reading, Ohio. This site is interesting as it has some late afternoon shade so the array was oriented to face slightly south east rather than true south. This actually improved the system performance by approximately 5% over a true south facing array. To wrap up, there are many factors which contribute to the performance and aesthetics of solar power systems. Each situation is different. By taking the time to analyze and discuss options with its customers, SunRock Solar can deliver a power system which melds aesthetic and performance expectations, with the reality of site conditions. Solar works well in Cincinnati! SunRock Solar has started using pole mounts to install photovoltaic systems for some of our customers. Pole mounts are a valid option when there is a small amount of roof space to install an adequate number of panels, the roof line is east/west, or there is too much shading to justify an installation. 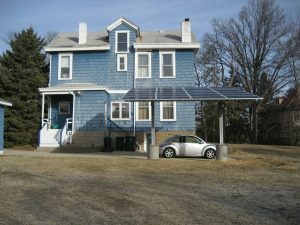 The poles consist of a single pole with a crossbar where the solar panels are mounted. There are two different sizes of poles that can hold either ten or fifteen panels each. Because everything is mounted on a single pole, the footprint of each pole is minimal. We buy the mounting system from a company called True South. The company is located in Ohio and the poles are also manufactured here. Another feature of these poles is that each pole has a hand crank, at the ground level, that can tilt the panels. In this way, the panels can be adjusted to give an ideal tilt for each month of the year. To see pictures of the installation of a pole mount system in our gallery, click here. 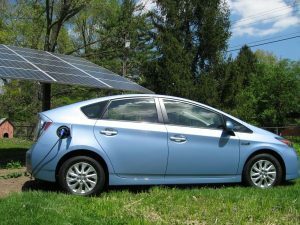 Mark your calendars for the Green Energy Ohio Tour which is taking place this year on Saturday October 1st and Sunday October 2nd. This year they have changed the name from the Solar Tour to the Green Energy Ohio Tour. The new name more accurately describes the tour which features not only solar but tour sites with wind, energy efficiency, biomass, and other green energy technologies. This is a free statewide event organized by Green Energy Ohio. The 2010 tour was the largest in the nation. SunRock Solar is well represented this year with 12 of our installations on the tour. The website to build your own tour is up and running although new sites may still be added. It is pretty slick. Just put in the region that you would like to visit and the time, and it will build a custom tour for you including directions and pictures of each of the installations. Click here to build your custom tour. 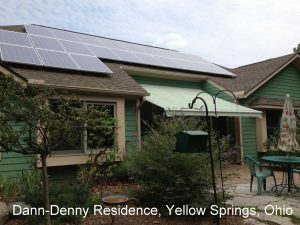 If you are thinking about adding solar to your life this is a unique opportunity to talk with owners who are living and working with green energy technologies. Come learn how friends and neighbors are combating rising energy costs, slashing utility bills, utilizing incentives and tax credits. 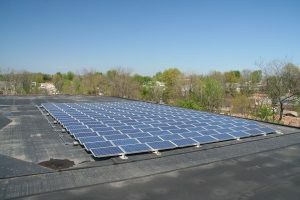 Mark your calendars for the 2011 Green Energy Ohio Tour (previously known as the Solar Tour.) This year the statewide event will take place October 1st and 2nd. SunRock Solar will be well represented with 10 houses on the tour. The GEO website with more information will be available early September. You will be able to create your own tour by entering your zip code, and the type of solar installations you are interested in viewing. Be sure to check out some of the exciting SunRock Solar installations. We will be posting more information here as it becomes available.